Homage to (my) Guru, Mañjughoṣa. and to speak of (makes you) an unsurpassable instructor. of as much torment as there is in the world. which, if seen, turns that back. as being the essential point of your teachings? than your statements about dependent arising? of instructing than this statement? to cut all the webs of their mental fabrication, without any exception. How wondrous – a Teacher! How wondrous – a Safe Direction! How wondrous – a Supreme Speaker! How wondrous – a Guardian! who spoke excellently about dependent arising. the heart of your teachings. ever be able to comprehend your system? but in fact reasonable (in terms of one another). one would be asserting a plunge into an abyss of despair. to the vision of dependent arising in your teachings! by means of a self-establishing nature. therefore non-dependence does not exist. their depending on causes and conditions. than what is devoid of a self-establishing nature. and all mental fabrication could not be turned back. that everything is parted from self-establishing natures. Who could get the better of this? is there need to mention that they fit together? is the cause for your speech, O Guardian, being peerless. while from “this,” “this” arises as a result. These 2 certainties, without hindering one another, serve as (mutual) helps. What could be more marvellous than this? than to praise you in this way. some are hostile toward you. – it is they who amaze me. leading to there being no self-establishing natures. well-travelled by the Supreme Noble Āryas? with no contradiction on a single basis? from having a self-establishing nature. you said that all of them are like illusions. they can never find an occurrence (of fault) in the Dharma’s consistency. regarding any phenomenon, seen or unseen. that your other statements are valid as well. because one turns back the root of all one’s faults. because of their firm view of identity natures. from the depth of his heart? I cannot show even a tiny speck of good qualities (in myself). the slight amount of confident belief (I’ve developed) in you. you have an awareness of dependent arising. has originated and proceeded from dependent arising itself. And, moreover, it’s been for the purpose of Nirvāṇa (a release from suffering). You do not do anything that doesn’t bring about (such) pacification. who could not respect upholding your teachings? and bestows the two aims of the 9 kinds of beings. as well as your dear relations and your stores of wealth. by seeing your good qualities. following after her dear child. proclaiming these (teachings) with your Brahma-like voice. is a medicine like moonlight for the torment of my fever. over so many points, like tangled vines. and thereby have repeatedly sought your intended meaning. by a web of one doubt after the next. and outshining the constellations of the speakers of distorted (views). the deeds of your Enlightening speech are supreme. learned ones, be continually mindful of Buddha from this! and my study of (your) statements, Triumphant One, has not been poor. I pay respect like this to (you,) that Great Seer. is due to the kindness of my gurus. to be upheld by hallowed spiritual masters. remain unshaken by the winds of misconception. by having understood this manner of (your) teachings. and never loosen (my hold), for even a mere instant. by taking earnestly to heart immeasurable hardships. and guardians (of the Dharma), like Excellent Mahākāla and the rest. 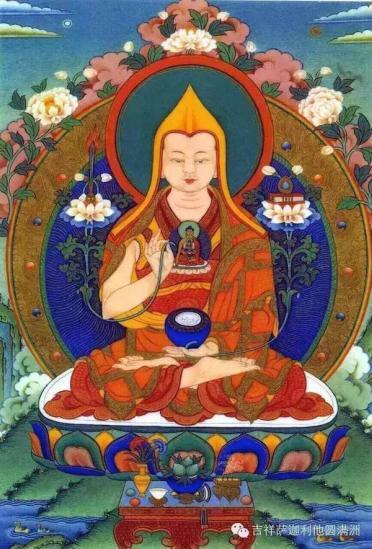 This has been composed by the Buddhist monk Tsongkhapa.